Jews rather than Muslims would have been the focus of Anders Behring Breivik’s hatred had he lived seven decades ago. Mr. Breivik’s choices would have been easier than. The young Norwegian with the good Aryan looks would have probably joined Adolf Hitler’s SS, the elite units who played a key role in attempting to exterminate the Jews. In an ironic twist of history, the very people Mr. Breivik’s ideological ancestors sought to eradicate are the ones who in his and those that share his views stand on the front line of civilization’s battle against Islam’s creeping annexation of Europe. And in an equally ironic twist, some members of the very Israeli and Jewish groups Mr. Breivik and other representatives of Europe’s extreme right wing see as their potential allies believe there is virtue in an association with racist and often latently anti-Semitic groups who support Israel on the basis of questionable political and Christian beliefs. Mr. Breivick identifies in his manifesto four Israeli political parties as potential allies, including Prime Minister Benyamin Netanyahu’s Likud and Foreign Minister Avigdor Lieberman’s Yisrael Beiteinu. To be sure, Messrs. Netanyahu and Lieberman as well as mainstream Jewish leaders in Europe and the United States have expressed horror at Mr. Breivik’s killing of 76 innocent people and distanced themselves from his racist ideology. Nonetheless, they have yet to take a stand against individual members of their parties who have welcomed feelers from Europe’s extreme right wing such as Ayoob Kara, a Druze who is a Likud member of parliament and deputy minister of development for the Negev and Galilee, and Eliezer Cohen, a decorated Israeli war here and former Yisrael Beiteinu parliamentarian. The Israeli press and European Jewish leaders have taken Mr. Netanyahu to task for failing to censor Mr. Kara for his repeated contacts with extreme right-wing European politicians some of whom papers like Yediot Ahranot have labelled as neo-Nazis. Comments on Israeli news Websites, including Yediot Ahranot’s Ynet however suggest that a number of Israelis value the sympathy for Israel of Mr. Breivik and the extreme European right and share their concern about increasing Muslim influence in Europe. “Actually he has something there,” wrote one commentator. “The ideas are good. Too bad he implemented them the way he did,” said another. Just how widespread such empathy for European right wing racism is, is hard to gauge. Several Hebrew-language Websites rival Mr. Breivik’s racism but attract no more than a few thousand hits. The Oslo attacks have nonetheless fuelled Israeli and Jewish criticism of increasing links between Israeli and European extreme right wingers as well as Jewish groups such as Daniel Pipes’ Philadelphia-based Middle East Forum that like Mr. Cohen supports the likes of Geert Wilders, the Dutch politician who owes his rise to his virulent opposition to Islam. No doubt, Mr. Pipes, Mr. Wilders and Israelis who share Mr. Breivik’s fear of Islam draw a line when it comes to the slaughter of innocent people. “That the fight against Islam is conducted by a violent psychopath is disgusting and a slap to the face of the global anti-Islamic movement … We fight for a democratic and nonviolent means against the further Islamization of society and will continue to do so,” Mr. Wilders said in a statement immediately after the Oslo attacks. The problem is that they contribute to the ideological underpinnings as well as an environment of prejudice and hatred of political and ethnic groups that emboldens fringe radicals like Mr. Breivik in much the same way that certain Islamic clerics and intellectuals nurtured a feeding ground for groups like Al Qaeda. Europe’s genocide against millions of Jews, Gypsies and homosexuals served for much of the second half of the 20th century as a living warning of the danger that racial and religious prejudice poses. It’s a lesson that Israelis and Jews could long argue had been lost on many in the Arab and Muslim world. Jewish leaders and many Israelis fear that it’s a lesson that is now being set aside by some of their own. FIFA President Sepp Blatter has hinted for the first time that the scandal involving bribery charges against Mohamed Bin Hammam could lead to an investigation of Qatar’s successful bid to host the 2022 World Cup. 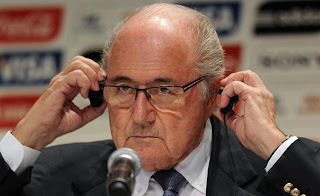 Speaking in Rio de Janeiro, Mr. Blatter said that he would initiate an investigation if his Solutions Committee, an advisory board that includes former Dutch star Johan Cruijff, former US Secretary of State Henry Kissinger and opera singer Placido Domingo recommended him to do so. The committee was established earlier this year to help Mr. Blatter resolve the worst corruption and bribery scandal in the world soccer body’s 107-year history. “Now, at this moment, we are not touching the Qatar World Cup. But we are going step by step into the matters we have to realize and if somewhere through this Solutions Committee they should say we have to have a look at that, then we will do that,” Mr. Blatter said. Mr. Blatter has until now rejected calls for an investigation into Qatar’s bid campaign that has been dogged by allegations of corruption and criticism because of the Gulf state’s searing summer heat. Mr. Blatter was strengthened in his refusal earlier this month when a whistle blower who had made some of the most damning corruption allegations said her charges had been fabricated because she wanted to get back at the Qatari bid committee for removing her from her job. Qatar has consistently denied any wrongdoing. The banning however last week of Mr. Bin Hammam, a Qatari national and head of the Asian Football Confederation (AFC), who was closely involved in the Gulf state’s bid, has prompted calls for an inquiry into his role, after FIFA last week banned him for life from involvement in soccer. Mr. Bin Hammam was accused of having bribed officials of the Caribbean Football Union (CFU) to support his failed campaign for the FIFA presidency. Mr. Bin Hammam has denied the charges and has vowed to appeal the ban. The AFC on Friday, in a victory for Mr. Bin Hammam, delayed until May next year the holding of an election to replace him. An investigation into the Qatari bid could lead to the Gulf state being deprived the right to host the 2022 World Cup. The nature of the allegations against Qatar make a ruling against the Gulf state at best very difficult, The charge that Qatar bribed two FIFA executive committee members to secure their votes for its bid have fallen by the wayside with the retraction by the whistle blower. Mr. Blatter confirmed earlier this year that Qatar had entered into an illegal agreement with Spain and Portugal, which were jointly bidding for the 2018 World Cup, to swap votes but dismissed it as unimportant because it had not influenced the outcome of the vote. The Spanish-Portuguese bid like that of England, where feelings are bitter, lost out to Russia. Allegations that Qatar invested in the home countries of some executive committee members, while possibly true, are not necessarily in violation of FIFA bidding rules. The issue of whether it would be ethical to do so is an issue that FIFA rather than Qatar would have to address by tightening its rules. Nonetheless, Mr. Blatter, by no longer ruling out an inquiry into the Qatari bid, could be travelling down a slippery road. There is widespread resentment against Qatar’s hosting of the World Cup because its oil and gas riches allowed it to spend far more than its competitors on its bid campaign. The controversy over Qatar is further fuelled by the fact that it won the bid despite a negative report by a FIFA inspection committee and the fact that cooling technology that the Gulf state expects to employ in stadiums to reduce temperatures from above 40 degrees Celsius to 27 degrees is as yet unproven. The Asian Football Confederation (AFC), acting on advice of its legal committee, has delayed a decision on elections to replace its suspended president, Mohammed Bin Hammam, until May of next year. The AFC’s 19-member executive committee in a meeting in Kuala Lumpur on Friday was expected to call for elections after world soccer body FIFA last weekend banned the 62-year old Qatari national for life from involvement in soccer because of alleged bribery. Mr. Bin Hammam has repeatedly denied any wrongdoing and has vowed to fight the FIFA decision. Mr. Bin Hammam in a letter to AFC members earlier this week said he would not resign his post as head of the Asian football body as long as he was appealing FIFA’s decision and asked for the AFC’s patience and understanding. The AFC said it was establishing a committee to investigate Mr. Bin Hammam’s situation. AFC’s legal committee advised the executive that the organization would have to hold an extraordinary congress and election if Mr. Bin Hammam’s appeals were not resolved by May 30, 2010. AFC’s statutes allow the position of president to be vacant for up to one year. The executive committee constitutes a tactical victory for Mr. Bin Hammam, who was initially suspended in late May by FIFA pending the outcome of an investigation. It was that investigation that prompted FIFA’s ethics committee to ban Mr. Bin Hammam last weekend. The disgraced Qatari national was accused of bribing officials of the Caribbean Football Union (CFU) to support his failed FIFA presidential campaign. Mr. Bin Hammam withdrew his candidacy hours before he was suspended, paving the way for FIFA president Sepp Blatter to be re-elected unchallenged for a fourth term. Mr. Bin Hammam has claimed that the bribery charges against him were trumped up to ensure that Mr. Blatter would win the election. Various AFC executive committee members, including Japan Football Association president and former FIFA executive committee member Junji Ogura and FIFA vice president Prince Ali Al Hussein of Jordan, had urged the group not to delay an election to replace Mr. Bin Hammam. The AFC has declined to comment on its decision beyond the statement it issued. Reporters were banned from the building where the executive committee was meeting and requests for interviews with Mr. Zhang and other officials were rejected. Mr. Zhang however was nominated to take Mr. Bin Hammam’s seat in FIFA’s executive committee as an acting member. Mr. Bin Hammam is the third serving FIFA executive committee member banned from soccer for ethics violations in nine months. A fourth, FIFA vice president Jack Warner, dodged the panel’s judgment by resigning from all of his soccer positions last month before answering charges about his part in the bribery plot that led to Mr. Bin Hammam’s downfall. The scandal is the worst in FIFA’s 107-year history and has sparked concern among sponsors of the World Cup, the world’s biggest sporting event. Nonetheless, none of the sponsors that include Emirates, Visa, Adidas and Coca-Cola, have indicated that they may withdraw from sponsorship of the 2014 World Cup in Brazil. FIFA officials believe that Mr. Blatter’s efforts at reform and the proceedings against Mr. Bin Hammam have convinced sponsors that FIFA is serious about rooting out corruption. “The code of ethics, and also an ethics committee, have now been able to function efficiently and function independently. That wasn’t the case prior to that,” FIFA executive committee member Chuck Blazer said in an interview with Bloomberg. Mr. Blazer initially brought the charges against Mr. Bin Hammam that led to his downfall. The mysterious killing of the commander of Libyan rebel forces foreshadows the difficulties a post-Qaddafi Libya will encounter once it embarks on a transition toward democracy irrespective of who was responsible for the assassination. Libyan rebel leader Mustafa Abdul Jalil’s assertion that forces loyal to Libyan leader Col. Muammar Qaddafi were responsible for the killing of General Abdul Fatah Younis and two other commanders does little to address the issues raised by the incident. Perhaps most importantly, Mr. Jalil was denying by implication that the commander had been killed by rebel fighters. Countering reports that General Younis had been arrested hours before his death for questioning about his relationship with Mr. Qaddafi, Mr. Jalil suggested that the commander had been killed as he was returning to the rebel capital of Benghazi from Port Brega. Mr. Jalil’s statements raised more questions than they provided answers. General Younis was known to have always travelled with a large security detail. Mr. Jalil said the killers belonged to an armed gang, one of whom had been arrested, but suggested that General Younis’ body had yet to be found. General Younis has been a controversial figure since his defection to the rebels in February. A close associate of Mr. Qaddafi, who was with him since the mercurial colonel staged a military coup in 1969, General Younis said at the time of his defection that he could not justify the Libyan leader’s brutal crackdown on anti-government protesters. From the moment he defected, General Younis, who served under Mr. Qaddafi as interior minister and head of special forces, was locked into a fierce rivalry with another general, Khalifa Hifter, who had switched his allegiance for command of the rebel forces. Many rebel fighters distrusted him. His death not only raises questions about the degree of unity within the rebel Transition National Council (TNC) at a time that the rebels have failed to make significant military advances but also calls into question the image of a movement seeking freedom and democracy that the leadership forum has been seeking to project. The TNC has been recognized by the United States, Britain, the European Union, the Arab League and NATO as the sole legal governing authority in Libya. The TNC’s resorting to tribal politics in the immediate aftermath of General Younis’ death however suggests the challenge post-Qaddafi will face in trying to build institutions from scratch in a nation that has been ruled on the basis of tribes for the four decades. TNC officials are reported to have spent significant time from the moment of General Younis’ reported detention and certainly from the moment that news of his killing started to leak in an effort to mollify angry members of the commander’s Obeidi tribe, one of the largest and most influential in largely rebel-held eastern Libya. Many Obeidi are believed to be convinced that the TNC may have been involved in the commander’s death. Mr. Jalil sought to counter those allegations by taking two tribal elders with him rather than members of the TNC when he announced General Younis’s murder in a terse statement at a Benghazi hotel. Mr. Jalil repeatedly paid respect to the Obeidis for their sacrifice and understanding and praised them for the understanding they had displayed. Dozens of angry tribesmen gathered outside the hotel hours earlier when Mr. Jalil first scheduled his delayed news conference initially believed to have been intended to confirm reports of the general’s detention for questioning. Armed tribesmen were reported to have arrived at the hotel during the news conference firing automatic weapons in the air and at the hotel’s windows. Witnesses reported clashes between the Obeidis and other tribes. The tribal clashes and the tribal politics surrounding General Younis’ death cast a shadow over plans to avoid once Mr. Qaddafi has been removed from office the problems Iraq faced because of the disbanding of Saddam Hussein’s military by to keep the Libyan leader’s security forces intact and integrate them with the rebel forces. The move would be designed to avoid the kind of sectarian violence that post-Saddam Iraq experienced. General Younis’ death suggests that a substantial peacekeeping force with a robust mandate will be needed to prevent tribal clashes and oversee the creation of a nominally unified Libyan force. Working in favor of integration and a smooth transition is the lack of a sense of revenge and the fact that at most five percent of the Libyan population benefited truly from the Qaddafi regime. Ironically, in a country that didn’t tolerate dissent and association with the regime was the only way to advance, much of the rebel movement has a history with Colonel Qaddafi. Rebel leaders have said they only want to prosecute Mr. Qaddafi and his closest associates and those with blood on their hands. The problem is that does not bode well for integration of the armed forces although in practice a degree of leniency may well be applied. The mystery surrounding General Younis’ death constitutes not only a blow to the rebels but also to its NATO backers who may now be dealing with a divided movement that can’t live up to its billing and that if and when it takes over power from Mr. Qaddafi may not have the wherewithal to build the kind of institutions Libya will need to successfully transit from autocratic one-man rule to a more open society. US reluctance to wholeheartedly call for the departure of autocratic leaders across the Middle East and North Africa is fuelling a revival of anti-American sentiment. Rising anger in countries like Bahrain, where significant US military and geo-political interests are at stake, and Syria, where the US is concerned about who might replace the incumbent regime, contrasts starkly with the absence of anti-American sentiment for much of the past seven months since the Arab revolt erupted in December 2010. The US was slow to endorse the demand for the departure earlier this year of one of its closest Arab allies, Egyptian President Hosni Mubarak. Nonetheless, this did not spark anger among anti-government protesters who noted the Obama administration’s endorsement a month earlier of Tunisian President Zine El Abedine Ben Ali. The US has also albeit ineffectually called for the removal of Yemeni President Ali Abdullah Saleh. In Egypt, Tunisia and Yemen, the US has sought to position itself as those countries embark on transition or in the case of Yemen struggle to get to the point of a transition by reaching out to opposition forces, including ones like the Muslim Brotherhood, that it kept at arms lengths when its autocratic friends were in power or not on the brink of demise. The US has also reached out to opposition forces in Syria and Bahrain. Nonetheless, that has not prevented the emergence of anti-American sentiment among protesters. In Syria, the US in consultation with opposition forces has played a supportive role in the background in what US officials describe as leadership from behind as opposed to leadership in the front row. This approach has meant that the US has imposed economic sanctions on Syrian president Bashar Al Assad, called for an end to Mr. Assad’s brutal crackdown on protesters, offered political advice to the opposition and provided it with assistance so that it can operate satellite television and broaden its access to the Internet. The support however has not prevented anger to mount at the Obama administration’s reluctance to call for Mr. Assad’s resignation. The Obama administration has consistently shied away from calling for Mr. Assad’s departure. Instead, it has repeatedly suggested that its preference would be for Mr. Assad to embrace the protesters’ demands for genuine political and economic reform. The US reluctance to drop Mr. Assad stems from uncertainty about who might succeed him. It is also concerned that it could lose face if it demands the president’s departure but is unable to force him to comply. Yet, it is US inconsistency and hesitancy alongside that of Europe and Turkey as well as support for Mr. Assad by China, Russia and Lebanese Shiite militia Hezbollah that is fuelling public anger in Syria. Protesters charge that US and Western reluctance is what keeps Mr. Assad in power because he is under no international pressure to step down. The US effort in Bahrain to, on the one hand, support change and condemn the government crackdown earlier this year that quelled largely Shiite Muslim mass protests and on the other to maintain close ties with the Sunni Muslim regime has sparked the ire of both communities. In fact, anger at the United States albeit for different reasons may well be the only thing the two communities agree on. Officials from Bahrain and the Gulf have charged repeatedly that Iran was instigating problems in the Gulf but Marshal Ahmad’s assertion gave the accusation a new twist. Bahrain’s February 14 youth movement named after the day anti-government demonstrations started on the Gulf island, in a harking back to the days before the Arab revolt erupted when anti-US protests in Arab countries were a dime a dozen, has called for a demonstration in front of the US embassy on Friday, according to the online opposition newspaper Bahrain Mirror. Marshal Ahmad’s targeting of the US is mirrored in the youth movement’s assertion that the US had supported the entry into Bahrain of Gulf Cooperation Council (GCC) forces at the invitation of the government and has asked Bahraini authorities to crack down on any protesters that gather on Friday in front of its embassy in Manama. If President Obama thought that delicately navigating the rocky cliffs of the Arab revolt would allow the United States to safeguard its national interests and at the same time support political and economic reform in the Middle East and North Africa, facts on the ground in Syria and Bahrain threaten to prove him wrong. Mr. Obama’s attempt to have cheesecake and eat it at the same time looks like it may backfire. Granted, the Arab revolt does not offer Mr. Obama easy choices. But if the rise of anti-Americanism on the streets of Syria and in Bahrain is any indication, Mr. Obama will have to make choices rather than straddle the fence if he wants to be, in the words of Secretary of State Hillary Rodham Clinton, on the right side of history. Figure this one out: Areas of Libya controlled by Col. Muammar Qaddafi could soon be in dire need of food and medical aid to cope with shortages and a broken healthcare system as a result of United Nations-imposed sanctions. That is if NATO and allied backed-rebels fail to either force Mr. Qaddafi from office or negotiate a deal that allows for a transfer of power. Qaddafi-controlled western Libya isn’t quite there yet, but is well on its way to becoming yet another part of the world struggling with a humanitarian crisis, according to the United Nations. The UN reported this week that a fact-finding mission it had sent to Qaddafi-controlled parts of Libya had found the region suffering from rising food prices, cash and fuel shortages and a decaying healthcare system. Ironically, the mission amounted to the UN surveying the consequences of its own actions. The UN Security Council has imposed sanctions on the Qaddafi regime that make importing fuel and goods difficult as well as a non-fly zone that on the one hand is supposed to protect innocent lives and on the other complicate Libyan attempts to circumvent the sanctions. To step up pressure on Mr. Qaddafi, NATO-backed rebel advances in Nafusa, a range of hills that stretch from Yafran southwest of Tripoli to the border with Tunisia, aim to cut the Libyan capital off from water and oil supplies. Tripoli gets much of its water and oil through pipelines from the southern area of Ghadames that traverse Nafusa. France recently disclosed that its air force had dropped arms and ammunition in Nafusa to reinforce the rebel efforts. The isolation of the Qaddafi regime is only likely to further increase as the rebel Transition National Council (TNC) that operates from the eastern city of Benghazi and controls much of eastern Libya garners increasing international recognition. Britain on Wednesday announced that it was breaking diplomatic relations with the Qaddafi regime, expelling Libyan diplomats and recognizing the TNC as the country’s sole legitimate representative. The move allows it to unfreeze seized Libyan assets and hand them over to the cash-starved TNC. It follows recognition of the TNC earlier this month by the Libya Contact Group, which groups the United States, the European Union, NATO and the Arab League. Few are going to rush to the aid of Qaddafi-controlled parts of Libya as the going gets tougher. In fact, the increased hardship in Tripoli and elsewhere is part of NATO’s strategy and from the alliance’s perspective it may well be working. NATO is working on Plan B after its Plan A failed. Plan A anticipated a quick collapse of the Qaddafi regime, either because NATO bombings, defections and sanctions would persuade the Libyan leader to throw his towel into the ring or the mounting pressure would convince one or more of his more people in his inner circle to remove him from power. Neither scenario played out. Nor did hopes that the rebels with allied backing would force Mr. Qaddafi on to his knees. Instead, Mr. Qaddafi has drawn the line in any negotiated settlement at being forced to go into exile. As a result, the TNC as well as major Western powers have reversed their positions and conceded in recent days that Mr. Qaddafi would be allowed to stay in Libya as part of any settlement as long as he leaves office and disappears into the wilderness. The Libyan Contact Group at its meeting in Istanbul earlier this month effectively adopted a Turkish roadmap for ending the conflict in Libya that anticipated the need for humanitarian aid for Qaddafi-controlled parts of Libya but put it in the context of an end to hostilities. The roadmap calls for the withdrawal of Qaddafi forces from all besieged towns and cities, UN peace monitors and establishment of humanitarian aid corridors, and a transition to a democracy with free and fair elections within six months. Hopes that an agreement could be reached before the beginning of the Islamic holy month of Ramadan early next week are fading quickly. Rebel leader Mustafa Abdel Jalil warned on Wednesday that the TNC’s offer that Mr. Qaddafi would be allowed to stay in Libya had expired. Mr. Jalil’s warning is little more than posturing designed to tighten the screws on Mr. Qaddafi. It’s a tactic that is unlikely to work. Mr. Qaddafi has made clear that what counts for him is what is said in Washington, London and Paris, not Benghazi. Neither Britain nor France has backed down from their concession that the Libyan leader will be allowed to stay in the country. Efforts to achieve agreement are however nowhere close to conclusion. As if achieving agreement on the modalities of a transitional post-Qaddafi Libya is not complicate enough, the International Criminal Court in The Hague this week threw a monkey wrench into the diplomatic machinery. The court warned that the arrest of Mr. Qaddafi so that he could stand trial for war crimes was non-negotiable. No agreement that allowed Mr. Qaddafi to live out his life in peace and quiet could cancel the obligation of countries like Britain and France to ensure that the ICC’s arrest warrant is executed. The court’s warning is likely to reinforce Mr. Qaddafi’s stubborn personality and his inclination to stick to his guns at whatever cost. That does not bode well for a resolution of the conflict any time soon. In fact, it may well help to make the irony of the need for humanitarian help for Qaddafi-held areas of Libya that result from the international community’s own actions a reality. Norway Terrorism: Who, why and what does it mean?